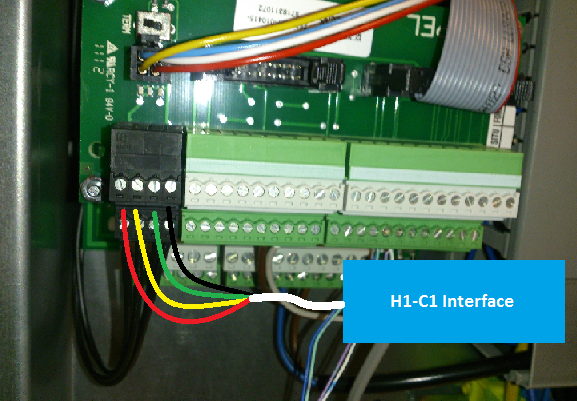 Interface install instructions for the H1-C1 interface for Rego1000 based heatpumps such as the IVT Greenline HE / HC series. Thank you for purchasing our solution for IVT / Bosch / Buderus / Junkers heat pumps using the H1 interface. 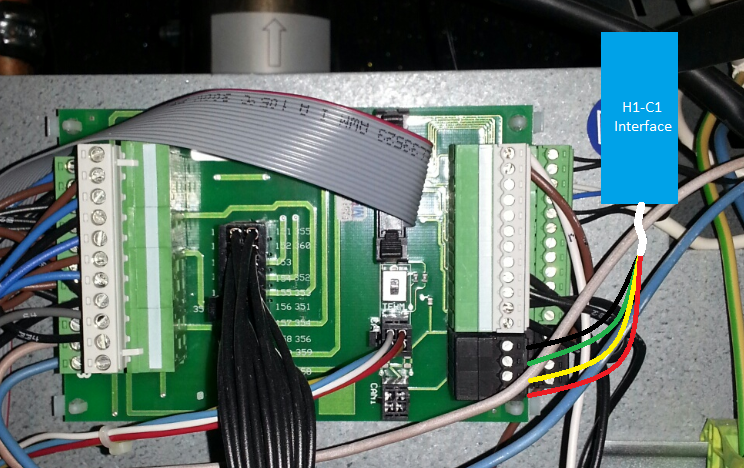 This interface is easy to install and supports upgradable firmware to enable for coming features. The H1 interface has to be synchronized (teamed) with your specific version of Rego1000. This will happen automatically at first power up of heat pump. Shortly after H1 har been synchronized there is a risk that communication problem alarms will be raised. To avoid that, restart the heatpump after 2 minutes of the first start with the interface. After synchronisation is performed it will be no alarms on power up of heat pump. 1. Power down the heat pump and open the front cover and the cover for the electrical parts. 2. Pull down the interface cable from a cable-hole on the heatpump top. 3. Locate the I/O card as pictured below. 4. Connect the 4 wire cable as instructed. Be very careful and double check that wires are conneted correct and are not loose. For easier access, the black connector can be pulled off. At FIRST power up of heat pump the LED flashes 12 times and then irregular for 6 seconds, Then LED lit continuously for about 8-15 seconds. After that it should flash irregular and fast continuously. At power AFTER the first start up of heat pump the LED flashes 12 times and after that irregular continuously. I'm about to install the H1-C1 but I have a couple of questions that I didn't find an answer to. 2. Does the H1-C1 provide any "galvanic" isolation between the DTE and the heat pump? 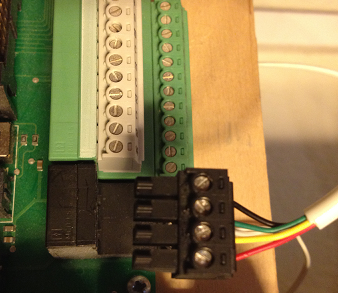 Is it advisable to add either a CAN bus or rs232 isolator to prevent damage to the heat pump? 3. Is it possible to switch between rs232 and rs485 on the H1-C1 or are those options physically different? 1. It is starndard RS-232 signal level, not TTL. There are no hardware flow control. No power is needed from the computer side. 2. The interface has a DC/DC converter for power and an serial data isolation circuit so there are no electrical connection between Computer and VP. You can add additional isolation if you feel more comfortable. However, several hundreds of these adapters are sold and I have not heard of any problems caused of isolation limits. In 10 years there have been 2 cases of lightning damages. But that took our heatpump, interface, all network equipment, TV:s in the houses and that is hard to fully be covered on. 3. They are physically different. any suggestion why my newly bought H1-C1 can not make connection with statlink to IVT Rego1000? At the bottom of the Statlink window stands "requesting firmware version"
Led in a H1-C1 is blinking irregularily all the time but didn't really see Led behaviour like instruction tells at the first time when power it up.